Diseases that have newly emerged within specific population groups or those with increased rate of incidence in the recent past are considered as emerging infectious diseases. Ecological changes, evolution of microbial pathogens, frequent traveling, bioterrorism etc. are some of the prime reasons for the outbreak of infectious diseases. Proper public health and vaccination programs can reduce the spread of infectious diseases to a great extent. However, the return of old communicable diseases, the emergence of new ones, and the evolution of antimicrobial resistance has made treatments less effective and continues to present a challenge. Emerging infectious diseases remain a major public health concern in the United States and around the world. 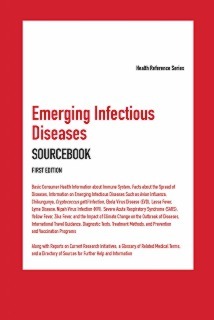 Emerging Infectious Diseases Sourcebook, First Edition provides information about various emerging and re-emerging infectious diseases and explains how the immune system works against these infections. It describes how climatic changes impact the outbreak and spread of infectious diseases. Guidance for international travelers to protect themselves from such diseases are also provided. Types of diagnostic tests, treatment methods that are available, and preventive measures for different kinds of infectious diseases are also explained in detail. The book concludes with a glossary of related terms and a directory of additional resources. Part I: What You Need to Know about Infectious Diseases begins with an introduction to emerging and re-emerging infectious diseases and explains how the diseases get transmitted. It also describes the functions of the immune system and how it works to recognize or fight against infectious diseases. Part II: Types of Emerging and Re-Emerging Infectious Diseases provides facts about specific diseases of concern—from avian influenza to Zika fever—in individual, alphabetically arranged chapters. Part III: Emerging Infectious Diseases Risk Due to Climate Change explains how climatic changes influence and affect the environment around us—air, soil, water, and food—resulting in the outbreak and spread of several infectious diseases. It also discusses about the health impacts of climatic changes across different population groups in the United States and preventive measures to be taken to minimize the impact. Part IV: International Travel and Infectious Diseases provides guidance for international travelers to stay away from infectious diseases. It also deals with aircraft and vessel management systems to prevent the spread of diseases. Part V: Medical Diagnosis and Treatment of Infectious Diseases outlines the tests and procedures used to identify the presence of infection or the infection causing pathogens. Antibiotics, antivirals, prescription medications, and other over-the-counter (OTC) medicines available for emerging and re-emerging diseases are discussed. The growing problem of antimicrobial resistance—the way microbes change to counteract the effectiveness of drug treatments—is also explained. Part VI: Preventing Infectious Diseases offers information about a simple practice that is a key element in the fight against the spread of germs—handwashing. It provides information on vaccines, another effective tool for halting the spread of disease. It provides vaccine recommendations for children, adolescents, and adults and also addresses problems associated with vaccines, the vaccine adverse event reporting system, and the difficulties that can arise as a result of vaccine misinformation. It concludes by discussing quarantine and isolation for controlling contagious diseases. Part VII: Additional Help and Information offers a glossary of important terms and a directory of government agencies and private organizations that provide help and information to patients with emerging infectious diseases.